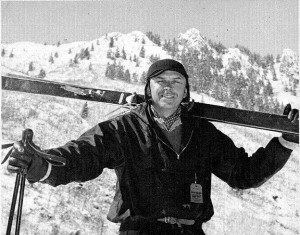 Howard Head returned to Baltimore, Maryland, after his 1947 ski vacation in Stowe motivated to design and make a better ski. He was an aeronautical engineer and knew that metal had replaced wood in airplanes because of its superior strength-to-weight ratio. So why not metal skis? He used his life savings, rented a shop in Baltimore, and began making prototypes. Stowe still played an important role in this process since he used Stowe ski instructors to test the prototypes. The first prototype broke when an instructor just tried flexing the ski. Later versions still had problems and Howard was getting discouraged, but Stowe’s Neil Robinson kept encouraging him and trying the prototypes. In the Spring of 1950 Howard Head brought his latest ski to Tuckerman’s Ravine and had a young hot shot named Clif Taylor (later of Graduated Length Method fame) try them on the headwall. Clif liked them and Howard knew he had the ski he wanted. This version would become the Head Standard. Later in 1950 Howard Head incorporated the Head Ski Company selling stock to fund the operation and began producing the Standard. The ski sold for $85 a pair which was significantly more expensive than the wooden skis of the era. But Head tirelessly marketed the ski and by 1955 Head skis were the leading brand of ski sold in the United States and Europe. I received a call this week from Jean Wickart of Morrisville, VT. Her husband, Roman, came to the United States from Switzerland in 1950 arriving in Baltimore. There Roman met Howard Head and went to work for him. This was in the early stages of the company when money was scarce so when Roman left to become a ski instructor at Sun Valley, Howard paid him in skis! Roman later came to Stowe to join the Sepp Ruschp ski school and here he met Jean. Jean and Roman started the Morrisville school ski program and with Sepp’s support, utilized Stowe Mountain Resort. The program continues today on Sundays at the resort. Oh, and those skis Howard Head gave Roman? Roman held onto the skis for many years finally shipping one pair to the Smithsonian. Back to Howard Head: In later life Howard took up tennis and once again he felt the equipment used could be improved. He patented the oversized racquet heads that are now universally used and pioneered the use of graphite racquets. Despite the fact that his ideas made so many people better skiers and tennis players, there is no evidence that Howard ever mastered either sport! For a much more complete story of Howard Head’s remarkable life and accomplishments read A Bad Skier’s Revenge by Stuart Leuthner. See, it all started in stowe vermont. Ive been all over the world skiing, and could live anywhere. I picked hyde park vt, to be close to where else, the world famous STOWE VT.
Website zufällig (stumbleupon). Ich habe Bucch markiert es für später!